CommaCommaCrash: Dear NASA: Thank you. Pretty standard sandwich board, right? But check out the zoom of that top image: Phone number and website have been erased to protect the not-so-innocent. And the picture is taken with a crappy camphone, but that pixellation is in no way exaggerated in the photo. Now I'll give you a second to figure out what's wrong with this picture. Really, you have as long as you want, because you have to move onto the next sentence, and I can't do anything to force you along. But now that you've wasted a good few seconds reading this explanation of that fact, I'll enlighten you if you haven't already figured it out. The problem is simply this: over a decade ago, our government, via one of its more useful and fruitful arms known affectionately (and officially) as NASA, spent two and a half billion dollars (with another half-billion from Europe) to send a probe through more than two billion miles of mostly empty space, in order to find out more about arguably the most beautiful planet in the solar system. 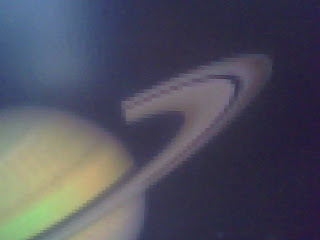 Nearly seven years later, it pulled up next to Saturn and began taking pictures, among other things. Lots and lots and lots of pictures. Thousands upon thousands, if not millions, of photographs. Staffers at NASA then stitched some of these pictures together to create truly gargantuan portraits of our celestial neighbor that in their full glory can only be described as indescribable, although truly stunning is a first stab at it. Then NASA, being a government agency, gave these portraits away to the public, free for use by anyone, including office buildings that want to spice up their sandwich boards. I even double-checked, and basically, as long as you're not implying NASA's endorsement of your product, you're free to use them as you please. 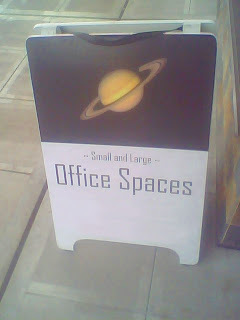 With images upwards of 25 megapixels readily available, there is no reason that a pixellated image of Saturn should appear anywhere, much less on a 3x2 foot printed sign. But then again, had it not appeared, I wouldn't have gone digging through NASA's archives, which has some pretty fantastic stuff to say the least. I found something as simple as a glimpse at Saturn's atmosphere fascinating. All in all, I came away with a renewed awe and gratitude for the incredible gift NASA has given, and continues to give, our country, and indeed, humanity at large. And hey, they have a sense of humor to boot.